The land of Kakhabad is a wilderness - a ruined desert, a tangled forest, cruel mountains and fissures, all guarded by seven fearsome serpents. But you must cross this land if you are to reach Mampang and the Crown of Kings. Rely on your wits or fight your way through - play with honour, or lie, cheat and steal - the choices are all yours. 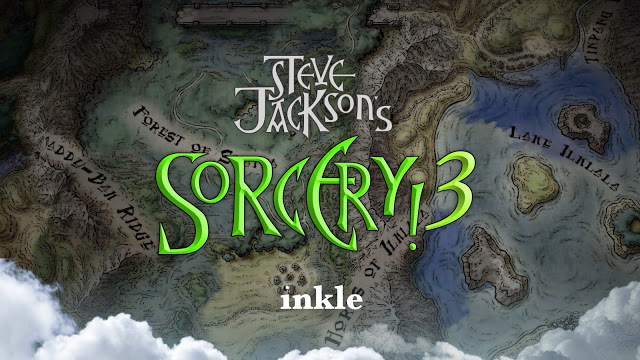 From the creators of TIME's Game of the Year 2014, "80 Days", comes the third instalment in the acclaimed Steve Jackson's Sorcery! series. An interactive story told through thousands of choices, all of which are remembered, where no two adventures are the same. Adapted and expanded from the million-selling gamebook series by legendary game designer Steve Jackson, co-founder of Lionhead Studios (with Peter Molyneux) and co-creator of Fighting Fantasy and Games Workshop (with Ian Livingstone). Using inkle's unique inklewriter technology, the story is written in real-time, built around your choices and actions. Sorcery! 3: download via Google Play!